Not overly discouraged with only one sign-up, since I knew there was a minor peak climb led to Yosemite this weekend that drew away many potential climbers, I left after work as usual Friday evening to make the long drive down U.S. 99. We camped along the way, and, I'm sure, enjoyed a nice breakfast in Giant Grove before starting on the climb. Taking the Cahoon Meadow trail north from Lodgepole Campground, we soon ran into snow. 1986 was a moderately big snow year. I was able to follow the wide trail to our turnoff just before a creek. We found a use trail that leads upstream to Silliman Meadow. From there, after a half mile further along the creek, it was almost continuous snow to the top. The snow was firm, and we had ice axes. Clouds drifted about overhead, and we climbed well and expediently. Large granite slabs marked our route up a large snowfield. We reached still-frozen Silliman Lake in due time, and I incorrectly went for a likely-looking peak to the east. My companion followed. As we came to the top, there was some exposed class three rock. Sometimes, I just imagine the guidebook is wrong, or that we are slightly off-route somehow. I made the exposed moves, with Steve following, then realized that this wasn't it. Steve said patiently that another peak, over to the west, was the top. I studied my maps, then decided we had nothing to lose. Time was running out. Ambling over talus and more snow, we found that indeed, it was. The summit register is sometimes the clincher in these events of uncertainty. With clouds all about us, we enjoyed our summit stay. I took plenty of pictures of the snowy view. Getting down was simple. We glissaded along, following our bootprints. Back to Silliman Meadow, we followed the use trail back to the main trail, and then back to the campground. Some camper had told us earlier that we wouldn't make it. He didn't know us! We had plenty of daylight left. Visiting the General Sherman Tree, the biggest sequoia, and thus the one to see, we went for a stroll on easy park trails around the Congress Grove. I like to make use of our time, and my partner was of like mind. We stayed in the local Park campground, and I no doubt had dinner at the cafeteria. We spent some time into the late evening at the pool tables in the adjacent bar. How full of energy we were then! The next day, we started early again for our hike to the top of Alta Peak. The Wolverton ski area has a large parking lot. The nearby trail is well signed. Normally, this is a pleasantly challenging trail hike in the summer, but we would have even more challenge today with all of the snow. We could follow the highly forested trail most of the way to Panther Gap. Snow patches could be negotiated. I knew part of the trail's route from my ski tours to Pear Lake Hut a few years ago. Markers on the trees point out the ski trail. Then, turning a corner of the peak, we hiked on the trail going along south-facing slopes, mainly bare. But then, gaining altitude, we came to solid snow, and headed directly up to the top. Again, it was straight-forward snow climbing, with little sinking into any snow. The temperatures were warm enough, us climbing in a cotton shirt or polyester top. We headed more directly up than the summer trail route, then reached the summit by about lunch. Looking through the register was fun. I shot more pictures. What a glorious weekend! I probably did over 4,500 vertical feet of standing glissades on both peaks. The conditions for this were excellent. Steve mainly plunge-stepped, not being a SMS backcountry skier, like me, and then thoroughly accustomed to sliding on snow. Again, we followed our tracks back in the snow. Once again, after finishing with the climb, we had time to do more hiking. We drove back to Lodgepole, and took the easy two mile trail to Tokopah Falls. Here, a friendly marmot came to look at us. I sort of remember that we saw a bear as well. The water was flowing in a torrent. One doesn't need to wait for mid-summer conditions to enjoy the parks. While persons may spend thousands to go to the Alps or the Himalaya, I think plenty of challenge and incredible scenic beauty is available right here! We caught the sunset atop Moro Rock. A staircase trail cut into rock leads shortly to the top. Handrails make a good support for your camera. I took several pictures of the sun setting to the west, but only one chance picture came out well enough. Don't always go by your camera meter! We finished close to 10,000 feet of gain in these two days. I could have driven home that night, but since we had time off, we chose to camp another night. We drove home Monday via Grant Grove to the north, enjoying more Big Trees. Motoring west and then north through Fresno, we were both home early enough after this big weekend. 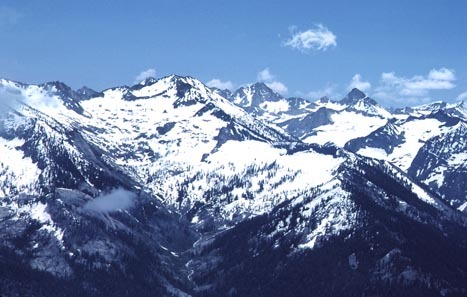 I was to climb Alta Peak two more times. Both times were in the early fall. 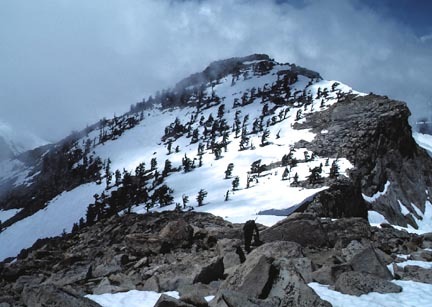 It makes a good, relatively easy, trail peak climb for those new to High Sierra climbing. Bring a map, gear for a long hike, and plenty of water.